What Does a Rhino Hear, and Why Do We Care? Many creatures, including the myopic Southern White Rhinoceros (Ceratotherium simum simum), depend on hearing and smell more than on sight. Thus their Soundscape (what they hear around them) is more crucial than their Landscape (what they see). Rhinos and some other species that are ever more endangered in the wild tend to breed poorly in zoos, which could lead to their eventual extinction. Herd size and composition, the age and experience of potential mates, substrate, exhibit design and other factors have been studied but little attention if any has been paid to their soundscape. The World Health Organization (1999) highlights how noise damages humans physiologically, with certain parameters such as impulse and fluctuating noise being particularly injurious. Might noise impact other mammals, particularly those with exquisite hearing, just as much? Are these injurious parameters present in the rhinos’ soundscapes? Animals are known to respond to some specific aspects of sounds, such as the spectral distribution of sound energy (Pater, Grubb and Delaney 2009). Are these aspects in their soundscapes? Studies show substantial changes in foraging and anti-predator behavior, reproductive success, habitat selection, vulnerability, longevity, abundance and community structure in a number of species exposed to noise (Barber, Crooks, and Fristrup 2010; Hildebrand 2009; Meyer-Holzapfel 1968; Spanier, Cobb, and Clancy 1994; Swaddle 2012; Weilgart 2007) and certain laboratory animals exposed to chronic noise exhibit many physiologically similar responses as humans ((Milligan, Sales, and Khirnykh 1993). The only small study relating to zoo noise and the well-being of rhinos suggests the advisability of further research (Carlstead et al. 1999). Nature is dominated by biophonic (biologically produced) and geophonic (geophysically produced) sounds that are quickly absorbed by soil and vegetation (Krause 1987). Natural soundscapes are information-rich and directly and indirectly essential to survival (Wilson 1984), being the basis of diverse behaviors from courtship and navigation to detecting threats and locating prey (McKenna et al. 2013). Urban soundscapes are anthrophonic, with vastly different physical and semantic characteristics and information that is buried in the pervasive noise. Sound reflects off hard geometric surfaces, distorts and reverberates. Much of it is infrasonic or ultrasonic, too low or too high for humans to perceive but well within the hearing range of other species. Urban zoos tend to be enveloped in these anthrophonic soundscapes. Figure 1 reveals the sound shadow favored by one urban zoo rhino whose enclosure is below a major road intersection. The sound environment was recorded first from the general open area of the exhibit (position 1) and then by leaning towards the rhino's favorite resting place below a ledge (position 2). Figure 1. He had found a sound shadow, as indicated in the center of this sound clip by the reduced waveform (acoustic pressure over time) and spectrogram (frequency over time) recorded at position 2 near his regular hideout. A considerable amount of low frequency noise is also evident, but it too is reduced in his hideout. So how might the soundscapes of zoos in which rhinos (and other species) breed well, differ from soundscapes where they do not? The first step to finding out is to develop a reliable methodology to measure as many types of acoustic parameters as possible in the soundscapes that these animals are exposed to. Determining whether there are significant correlations between certain parameters of a soundscape and the health and reproductive success of its animals could lead to modification of the acoustic environment of zoos in the way other aspects of exhibits have been improved in recent decades. This project develops a methodology to measure such soundscapes. Rhinos have been recorded vocalizing infrasonically and sonically from 5 hertz (Hz) or even lower (Baskin 1992) up to almost 8 kHz (Policht et al. 2010), but anecdotal evidence of high whistles of glee also exist. Thus a wide range of frequencies needs to be analyzed. In addition to acoustic parameters, humans have been shown to respond poorly to vibration. Certain species including elephants and rhinos appear to communicate by stomping their hooves and "listening" to sensations they feel in the ground. This indicates they are likely to be particularly sensitive to ground vibration. So seismic noise should also be considered. 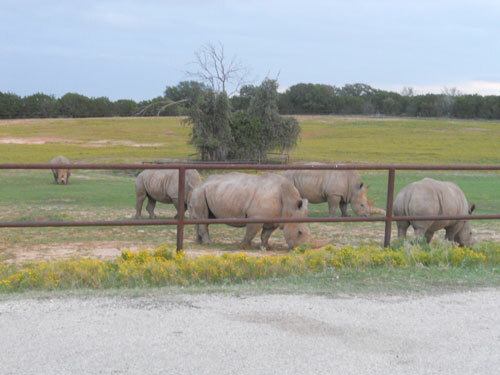 The project recorded and is now comprehensively analyzing and documenting the infrasonic, sonic and seismic soundscape around the white rhino enclosure at Fossil Rim Wildlife Center in Texas, one of six Conservation Centers for Species Survival and one of the few facilities to successfully breed white rhinos in recent years (see Figure 2). Three sonic acoustic systems with 10 microphones, weatherproofed and powered by 12 volt batteries supported by solar panels, recorded along one side of the rhino enclosure continuously for a week. 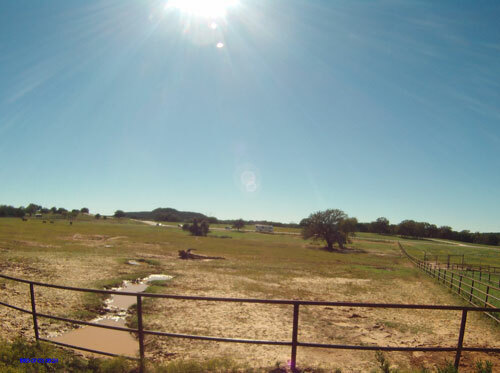 In a collaboration between Baylor University (Geology Department) and Texas State University-San Marcos (Geography Department), Reftek geophysical infrasonic and seismic data acquisition systems with six sensors plus a geophone were used to capture frequencies too low for humans to hear, and the ambient seismic background noise respectively. 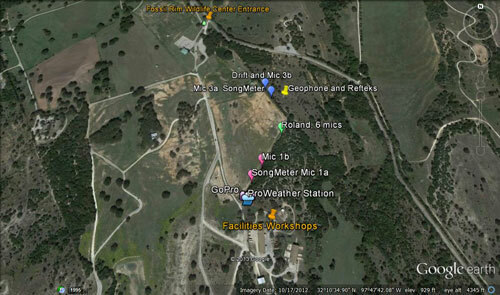 Raven Professional Software was chosen for the sonic analysis, and Matlab for the infrasonic. Cameras were mounted at each end of the enclosure while a ProWeather station monitored changing atmospheric conditions. Figure 3 shows the equipment layout, and Figure 4 shows the view from the northern Drift video camera. 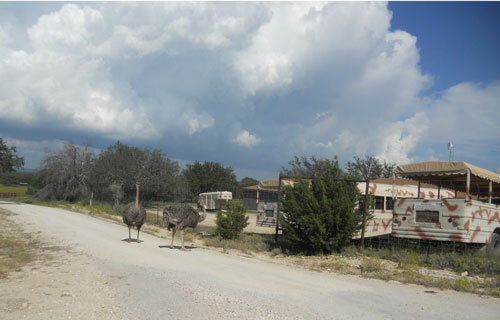 Fossil Rim, which is so successful in species survival, is proving far more characteristic of a natural soundscape than an anthrophonic one, particularly once visitors and staff leave each day. Nightly keynotes are wind (geophonic), insects, birds and other animals (biophonic). 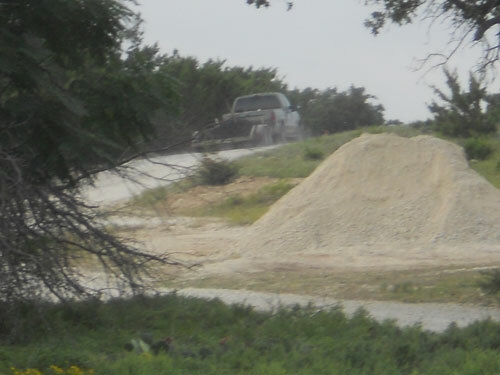 Vegetation and soil muffle the anthrophonic county and local traffic, although depending on the wind direction from time to time aircraft may be heard as they fly over the nearby Glen Rose reporting point, approximately 70 miles southwest of Dallas Fort Worth. Dominant daytime sound signals include keepers’ feed trucks and voices, zoo safari bus tours and maintenance and visitors’ vehicles and voices, sound sources seen in Figures 5 and 6. Figure 5. Fossil Rim safari buses generally depart once or twice a day from the utilities carpark near the southern end of the rhino enclosure. Once a reliable methodology has been proven to measure and characterize the sonic, infrasonic and seismic soundscape of a captive animal facility, a range of soundscapes in which any endangered species is healthy and is reproducing can be compared with soundscapes in which that species is not. Frequencies within the auditory thresholds of specific species can be especially analyzed. Correlations can be identified, along with any associations with the animals' physiological and behavioral status. Problematic acoustic parameters can then be addressed and hopefully ameliorated. Ultrasonic soundscapes could be analyzed in a similar manner for appropriate species. So knowing what rhinos hear in areas where they are held captive and correlating these acoustic parameters with their health, well-being, longevity and reproductive success will teach us to think anew about the implications of soundscapes and guide us to study them not only for endangered species, but for all captive animals in conservation, agricultural and even domestic environments, and for wildlife in parts of the world that are being increasingly encroached upon by man. Barber, J. R., K. R. Crooks, and K. M. Fristrup. 2010. The costs of chronic noise exposure for terrestrial organisms. Trends in Ecology & Evolution 25:180-189. Baskin, Y. 1992. The rhino's silent call. In Discover Magazine[database online]. 1 April. http://discovermagazine.com/1992/apr/therhinossilentc38(last accessed 11 November 2013). Carlstead, K., J. Fraser, C. Bennett, and D. G. Kleiman. 1999. Black rhinoceros (Diceros bicornis) in US zoos: II. Behavior, breeding success, and mortality in relation to housing facilities. Zoo biology 18:35-52. Hildebrand, J. A. 2009. Anthropogenic and natural sources of ambient noise in the ocean. Marine Ecology Progress Series. 395. Krause, B. 1987. The niche hypothesis. Whole Earth Review. Wild Sanctuary. Pater, L. L., T. G. Grubb, and D. K. Delaney. 2009. Recommendations for improved assessment of noise impacts on wildlife. The Journal of Wildlife Management 73:788-795. McKenna, Megan F., et al. "Patterns in bioacoustic activity observed in US National Parks." The Journal of the Acoustical Society of America 134.5 (2013): 4175-4175. Meyer-Holzapfel, M. 1968. Abnormal behavior in zoo animals. Abnormal behavior in animals 476-503. Milligan, S. R., G. D. Sales, and K. Khirnykh. 1993. Sound levels in rooms housing laboratory animals: an uncontrolled daily variable. Physiology & Behavior 53:1067-1076. Pater, L. L., T. G. Grubb, and D. K. Delaney. 2009. Recommendations for improved assessment of noise impacts on wildlife. The Journal of Wildlife Management 73:788-795. Pijanowski, B. C., A. Farina, S. H. Gage, S. L. Dumyahn, and B. L. Krause. 2011. What is soundscape ecology? An introduction and overview of an emerging new science. Landscape Ecology 1-20. Policht, R., K. Tomasova, D. Holeckove, and D. Frynta. 2010. The vocal repertoire in Northern white rhinoceros Ceratotherium simum cottoni as recorded in the last surviving herd. Bioacoustics 18:69. Schafer, R. M. 1977. The tuning of the world. Knopf. Spanier, E., J. S. Cobb, and M. Clancy. 1994. Impacts of remotely operated vehicles (ROVs) on the behavior of marine animals: an example using American lobsters. Marine ecology progress series. Oldendorf 104:257-266. Swaddle, J. P., K. L. Cornell, C. R. Kight, R. B. Burdge, A. R. Gunderson, J. K. Hubbard, A. K. Jackson, J. E. LeClerc, M. L. Pitts, and D. A. Cristol. 2012. Noise pollution is associated with changes in breeding behavior and fitness of eastern bluebirds. Paper presented at: 49th Annual Meeting of the Animal Behavior Society, 12 June 2012, Albuquerque: University of New Mexico. Weilgart, L. S. W. L. S. 2007. The impacts of anthropogenic ocean noise on cetaceans and implications for management. Canadian Journal of Zoology 85:1091-1116. Wilson, E. O. 1984. Biophilia. Harvard University Press. World Health Organization. "Guidelines for community noise". WHO Expert Taskforce Meeting. London. 1999.